The slogan has been used by the New York Times ever since its adoption in 1896. Perhaps because of the NYT’s influence, the message seems to have sunk deep into the world’s collective psyche, and most people believe themselves to be well informed if they read a newspaper, whatever their choice may be, every day. But of course, the day is short, the world is large, and reporters and editors are human too, working to tight deadlines. They are just as beholden to the people who provide cash flow (advertisers; often large, powerful companies) as any office employee to her boss. And so some of the news that’s fit to print never makes it to print or into the media. It’s hard to bite the hand that feeds even though the reporter might know it deserves a good nip on occasion. The example came powerfully home to me many years ago when I visited an orphanage that was run in exemplary manner; in the best way such an institution could possibly be run. I remarked to the director how relieved I was to know that such fine institutions existed, having seen a devastating documentary just a week earlier, broadcast by a sender of high repute. She perked her ears immediately. “Oh, was it by so-and-so?” she asked. So on top of financial pressures, there is reporter bias as well. Many reporters seem to think that only bad news sells. If the customer is king, then its up to us, the readers to stop buying all the crappy news that’s published. Here are a few good news websites below. This is only a tentative list. There are plenty more out there to look at or, better still, create your own for a guaranteed improvement in your quality of life. Despite its ills, the world is still a beautiful place, and one shouldn’t begin each day with a daily dose of despair. See more of this author here. 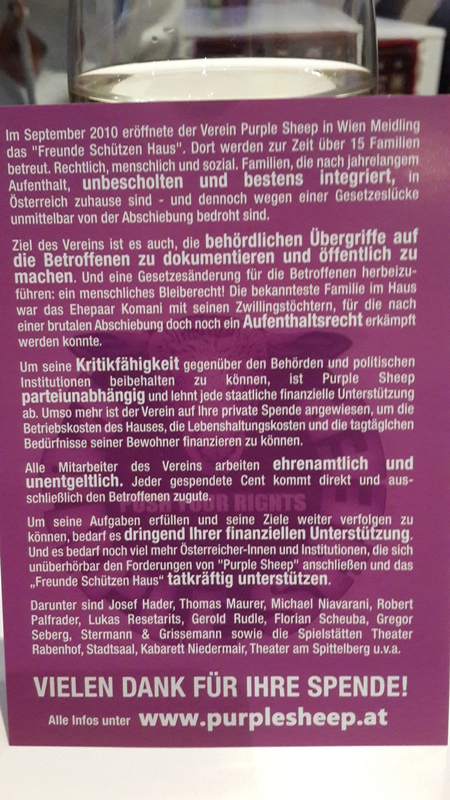 The city of Vienna has been governed by the Social Democrats, either alone or in coalition with other parties, since 1945. That’s an unbroken stretch of 70 years! Not bad for a governing party, considering that Vienna is a well-run city and has consistently ranked among the top 3 cities of the world for quality of life for the past decade or two. Among the reasons for the city’s success is the large number of initiatives by private citizens concerned about social justice in the age of globalisation. One of these initiatives is by a non-profit organisation called Purple Sheep with the avowed objective of keeping an eye on the government to ensure that the city obeys its own laws concerning the welfare of refugees. In brief, PS’s objective (stated in the photo below) is to keep track of, publicise, and protect refugees from excessive official zeal in upholding the law. Purple Sheep’s Agenda. They are grateful for donations to support their work. Every so often, registered refugees fall through cracks in the legal framework, are declared inelegible for asylum, and have to leave the country although they might have lived in Austria for years while waiting, and have become well integrated. Appeals are possible, but people live in a kind of limbo while waiting for a decision on an appeal, and they are not allowed to work during this period. So in early 2014, Purple Sheep decided to set up Purple Eat; a place where refugees waiting for a decision on their case for asylum (currently 15 families) can provide a service while conforming to the law. 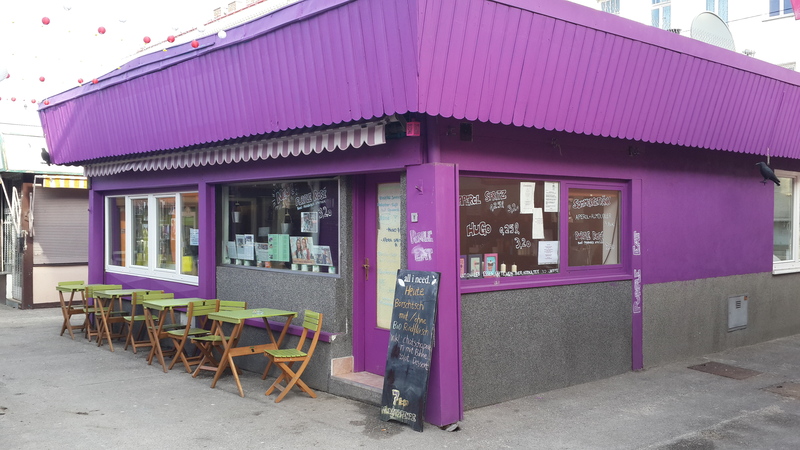 Housed in a distinctive purple container-like building among the other market stalls on the Rosaliagasse 5 in Vienna’s 12th district, Purple Eat serves a choice of 2 menus, 5 days a week, Tuesdays to Saturdays, from 11 am to 11 pm, prepared by the refugees themselves. What is on offer on a particular day depends on the nationality of the persons responsible for the meal. I visited the place on Thursday evening this week and found a choice of 2 main courses. A Haitian beef goulash, or a Georgian-style mushroom goulash, both menus accompanied by a standard soup, salad and a dessert (no choice here) for 7 Euros. I decided on the Georgian mushroom, and a glass of white wine. Unmistakably purple and friendly service, Rosaliagasse 5, 1120 Vienna. Be prepared for pleasant surprises. The soup arrived quickly, a delicious cream of tomato. It was followed by a salad. The lettuce was absolutely crisp and fresh. The dressing was obviously ready-made, out of a packet, but at 7 Euros for a 3-course meal, there are no complaints from this quarter. The Georgian mushroom goulash came next, served in typical Georgian style, topped with a dollop of cream and a sprinkling of walnut. Delicious. And for dessert, a small piece of freshly made cottage cheese pastry (topfen strudel). The menu price of 7 Euros is a recommendation. Customers are encouraged to pay more if they like, since all the money goes directly to the refugee families. Purple Sheep is apparently staffed entirely by volunteers (who don’t get paid, natch), so all the proceeds of go directly to the families who are cooking on that day. Expect a variety of menus, depending on the families who serve their traditional cuisine on different days. I encourage you to go there and be surprised. Books are Bad for You. I can imagine a conversation with friends who think it’s crazy to say that books are bad for your health. What a self-destructive statement for a writer to make; a writer whose three books have recently received more than a dozen positive reviews (see author page on Amazon) But it’s true. In different parts of the world, at different times, books have proved harmful to their authors, as well as to their owners and readers. The Index Librorum Prohibitorum was published in 1559 by the Pope and listed books deemed heretical, blasphemous or simply lascivious and were therefore banned. Various editions of the Index were published in later years. The 20th and the last edition was published as late as 1948 and it was only abolished in 1966 by Pope Paul VI. Probably the most famous victim of the Index was Giordano Bruno who was burned at the stake in Rome in 1600 although admittedly, to the Inquisition, his principal crimes were not his writings but his heretical skepticism of many Catholic beliefs including the Virgin Mary and the trinity. Closer to our time, in the 20th century, the list of books banned by Nazi Germany in the 1930s was long and included the literature of Marxism, Communism, pacifism, democratic writings and, of course, works by Jewish authors. During the cultural revolution in China between 1966 and 1976 a man who later became my close personal friend was sentenced to years in labor camp simply for being a mathematician with a small private library of books. His principal crime perhaps was to know more than the young Red Guards who conducted his trial, spat at him and made him walk around for months with a dunce cap on his head. Even these relatively recent incidents of the 20th century seem to have faded from a public mind that is drowning in information but starved of meaning. Precisely the reason why much of the world is reacting with demonstrations of outrage (rightly so) at the murders of 12 journalists in Paris while largely ignoring (sadly so) the massacre of 2000 people in Baga village in Nigeria where more than a million people have been internally displaced by Boko Haram’s violence. Boko Haram can be most literally translated as “books are bad for you,” where Boko means books, literature, the printed word, the world of ideas; and Haram means impure or unclean. Boko Haram’s primitive ideology thrives in the absence of the world’s collective outrage that would force local leaders to take more forceful action to stop this cancer from spreading. This is a cancer that can unleash a civil war and spread to several neighbouring countries; Cameroon, Chad and Niger. This is no longer only a Nigerian problem. In the age of globalisation, this is a problem for the world. Here is a link to the website of the Quilliam Foundation, an organisation that exists to fight the battle of ideas that lies at the roots of modern religious extremism, which is a form of theocratic fascism. Listen also to an interview with Maajid Nawaz, the co-founder of Quilliam who, as a former radical Islamist, is eminently qualified to talk about the topic. For those who despair at the directions that religious fundamentalism is taking the world, listening to the talk will be 43 minutes well spent. Thanks to Larry Willmore for his Facebook post drawing my attention to the talk. I started off intending to write about the Austrian New Year’s Eve custom of Bleigiessen and learnt several things today. First, the posh name for the practice is molybdomancy: the art of divining the future from the shapes of molten metal that is quickly thrown into cold water. Second, this is not only an Austrian custom, but is widely practiced in Germany and in the Nordic countries as well. Apparently in Finland, the practice goes by the name of uudenvuodentina and is quite popular. According to this source, the practice originated in ancient Greece and later travelled to the Nordic and Central European countries where the custom is still followed today, although the results are interpreted more in a spirit of fun rather than being taken seriously. No wonder the word molybdomancy has been quite forgotten! 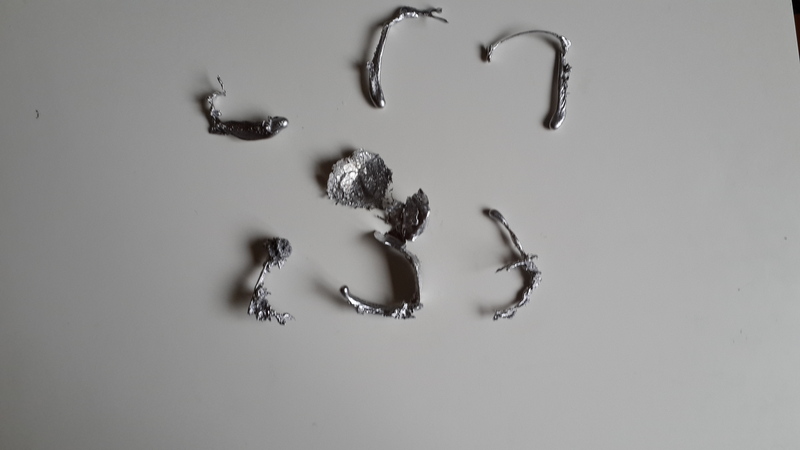 Originally made from tin, nowadays bleigiessen sets are sold in the streets in the week preceding New Year in small bags consisting of half a dozen pieces of tin or lead alloy mixed with cheaper metal. The pieces are molded into shapes associated with good luck; horseshoes, pigs, chimneysweeps, toadstools or 4-leaf clovers. I bought a bag for New Year’s Eve and settled down with six of my nearest and dearest to see what 2015 has in store for us. What 2015 has in store for the family. As you can see, the results are outstanding! 2015 is going to be a wonderful year for the family; two of them will perform exceptional deeds, while the rest will be merely brilliant. I wish all my readers a similarly uplifting prognosis.